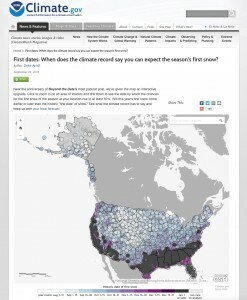 The National Oceanic and Atmospheric Administration (NOAA) indicates that certain areas in the United States can see snow this year as early as August. Make sure your organization has a well-coordinated, smooth, winter season this year. Integrating GIS into your snow and ice control plan, allows you to effectively plan your response, execute operations, and share important information with your constituents. There are numerous ways that cities, counties, and states all prepare for winter’s wrath. From creating snowplow routes and prioritizing street clearings to creating parking plans for your citizens, you need to have your bases covered. Keep your citizens safe and help them stay mobile throughout their own neighborhoods. 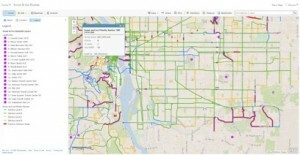 City of Portland uses web maps to organize and prioritize streets so that, in the event of a snowstorm, the plow crews know exactly where to start in order to keep traffic moving. City of Saskatoon overlays the priority streets, which are to be cleared, with blue highlighted parking bans. 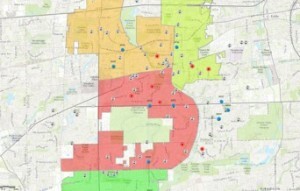 This map is used to identify where residents will need to remove their cars from the curb before plowing can begin. Now that you’ve prepared your tactics and field crews, put them into action. Set up a dashboard for real-time awareness with the Snow Common Operational Picture (SnowCOP) application to get a holistic view during a snow event. Communication between your field crews and the back office helps you understand the mobility status of your city, state, or county in the event of a snowfall. The color map in SnowCOP supports active truck monitoring and up-to-the-minute reporting to help you keep your streets clear. In its Snow Tech video, City of Boston demonstrates how its back office work is connected to its drivers on the road. The city’s contracted and employee snowplow drivers each carry a cellphone that tracks their progress and location throughout their route. The last step in a successful snow management strategy is identifying lanes of communication with the public you serve. Communicating via mobile or web applications can help your community stay safe and aware when snowplowing is under way. The SnowCOP application can also help to route constituent calls and place the call locations right on your snowplow maps to show where citizens need an active plow the most. Effective communication to and from your constituents is the final component to having a truly successful snow control. Iowa Department of Transportation hosts an online, real-time map to communicate to citizens exactly where the snowplows are. 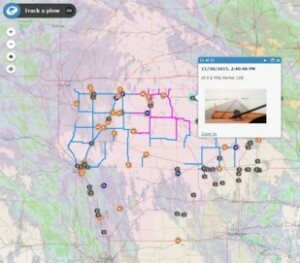 This map also posts pictures from each of the snowplows, documenting what the road and weather conditions look like at any given time on the route. 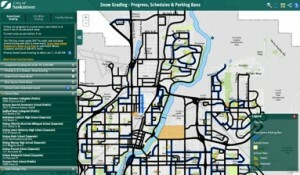 City of Minneapolis uses ArcGIS to display snow removal status. 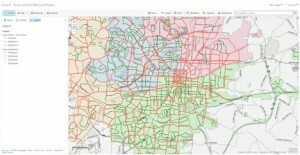 Specific colors identify which streets have been cleared and which still need to be tended to according to priority.